LG G Pro 2 went official 10 days prior the MWC. It has already gone on sale in Korea, while US and Europe will be getting in in March and April. The G Pro 2 is the successor of the Optimus G Pro phablet and upgrades all major specs. It comes with a larger 5.9″ 1080p IPS display, runs on the Snapdragon 800 chipset with 3GB of RAM, and comes with a 13MP camera with enhanced optical image stabilization (OIS+). The G Pro 2′s display looks great, colors are punchy, the viewing angles are OK too, though the performance under direct sunlight is rather unimpressive. Still the display occupies 77.2% of the entire front, which results in tiny screen bezels – indeed a great achievement. Other interesting key features of the LG G Pro 2 are the expandable 16 or 32 GB internal storage, the video recording capabilities – 4K@30 fps, 1080p@60fps and 720p@120fps, and the removable 3,200mAh battery. LG G Pro 2 is running on Android 4.4.2 KitKat skinned with LG’s proprietary Emotional UX. The phablet also introduces the so-called Knock Code – it allows the user to unlock his/her device by knocking on its display using a specific combination. We’ve tried this feature and it is indeed a very clever way to unlock the phone, you’ll need some time and quite a few attempts until you get used to its behavior. LG G Pro 2 is made entirely of plastic. Its back has barely visible texture, but is glossy and very slippery. We expected to find fingerprints and smudges all over the G Pro 2 after handling the phablet for a while, but as it turns out it is not prone to such unpleasantries. The back of the G Pro 2 has the already familiar control deck just below the camera – a Power/Lock key flanked by the two volume keys. Those can be configured to launch different apps (such as the camera) upon a long press. We’ve taken the LG G Pro 2 for a quick spin outside. We were eager to test its OIS camera, so we snapped e few photos. We’ve also shot two short 4K videos with the LG G Pro 2. The first we uploaded to YouTube for convenience, the second is available for download untouched. Enjoy! We’ll keep our comments on the quality for the retail review unit, but the G Pro 2 camera indeed looks promising. 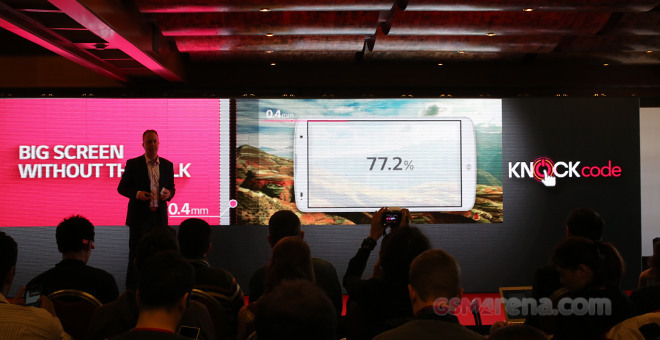 You can find more hands-on impressions over our dedicated LG MWC 2014 article.